Women in Trucking in collaboration with the National Transportation Institute is looking for trucking companies to participate in their 2019 Women in Trucking survey. Further information about the survey and a sign-up form can be found on the NTI website. The purpose of the survey of trucking companies is to create an index that tracks the percentage of women drivers and those in management positions working for trucking companies. Leah Shaver, Chief Operating Officer of NTI, said the 2019 survey is earlier than normal. “I would strongly encourage every company that employs truck drivers in our industry to participate in the WIT Index." Opportunities are expanding for women across the industry, and one of the key long-term solutions to the driver shortage will be the further expansion of the employment of women at motor carriers,” Shaver explained. She said that carriers' responses to the brief list of survey questions is the first step in creating the WIT Index; which allows them to chart progress and identify best practices for women in the industry. WIT, which has been in existence for 12 years, began working with NTI just three years ago when President and CEO of WIT Ellen Voie began collecting information on trends for women in trucking. NTI collects and analyses the data at no cost to WIT. Shaver pointed out that carriers are guaranteed confidentiality for the information they provide in the survey. Contributing carriers will not be specified within the index, and will receive a copy with aggregated results by region and fleet size. The 2019 WIT Index Survey will run through April 8, 2019. Matt Jeske, a driver from Elyria, Ohio, has the local ABC affiliate looking into his complaint about his vehicles being damaged by debris falling off of trucks on area highways. Jeske told the news station that in one episode a piece of metal off of a truck resulted in $3,000 worth of damage to his Cadillac. "A piece of metal flung up under the car and bounced around the engine compartment very violently,” he told News 5. After replacing his Cadillac with a Ford Taurus he said that within a week he got a u-shaped crack in his windshield. "Rocks were flying, and I caught one as you can see right dead smack in the middle!" he said. The problem, as stated by Insurance agent John Koetz of the Ohio Insurance Institute, is that trucking companies take a strong stance. "Prove to us that that rock is the exact rock that fell off our truck,” Koetz told News 5 the carriers will say. “And it's very difficult for a consumer to do that." 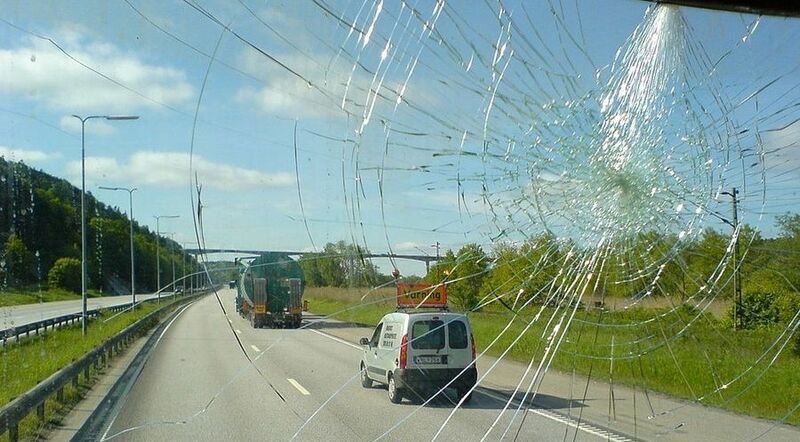 In the insurance world, Koetz said, if a motorist's car is hit directly by debris flying off of a truck then the truck drivers are held responsible. If something falls from a truck and hits the ground first and then contacts the motorist's vehicle it becomes a road-hazard claim, and not necessarily negligence on the part of the truck driver. In the world of law, however, there are state and federal laws mandating that carriers must cover their loads, and that truck drivers can be cited no matter whether something hits the ground first. The key is for motorists to have adequate documentation and proof that the damage to their vehicle was the result of debris from a particular truck – where the damage happened, which carrier and which truck, the license number, etc. But this is something that motorists often fail to do. And that gives rise to carriers' claims mentioned by the insurance agent to "Prove to us that that rock is the exact rock that fell off our truck." Jeske told News 5 he wants state patrol to do more. "I'm going to have my windshield replaced and hope it doesn't happen next week," he said. Acknowledging the recent flooding in northern and eastern states the Federal Motor Carrier Safety Administration released a declaration of exemption for truck drivers' hours of service regulations. The exemptions come with certain restrictions. 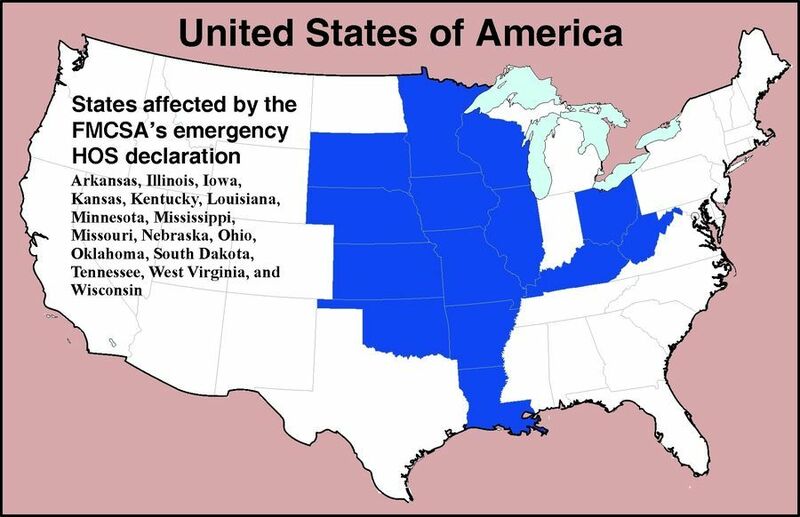 It applies only to drivers giving direct support and aiding in relief efforts in flood damaged areas of the states of Arkansas, Illinois, Iowa, Kansas, Kentucky, Louisiana, Minnesota, Mississippi, Missouri, Nebraska, Ohio, Oklahoma, South Dakota, Tennessee, West Virginia, and Wisconsin. 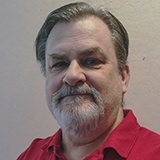 “Direct assistance terminates when a driver or commercial motor vehicle is used in interstate commerce to transport cargo or provide services not directly supporting the emergency relief effort or when the motor carrier dispatches a driver or commercial motor vehicle to another location to begin operations in commerce," notes FMCSA guidelines. The exemption will be rescinded on April 18, or when the emergency is declared ended. A hat that looks like a typical baseball cap and that employs technology designed to keep truck drivers alert will be part of the Wired to Wear exhibit at the Museum of Science and Industry in Chicago from now until May of 2020. Called Safe-Cap the hat is equipped with sensors that can interpret head movements and warns drivers with sound, light and vibration if it senses that the driver is about to nod off. It was created as a joint project between the Ford Motor Copany and GTB, a global communications company. "The Safe-Cap is the perfect example of a smart solution to a real problem made possible through creativity, technology, and a focus on putting people at the center of design. We make what matters—for people and for business," said Vico Benevides, Executive Creative Director of GTB Brazil. Wired to Wear is open to the public from March 21, 2019 to May 2020 at the Museum of Science and Industry. It is not included in museum entry and requires an additional timed entry ticket, $12 for adults and seniors, and $9 for children. The museum was visited by over 1.5 million guests in 2018. With more than 35,000 artifacts on display, it is the largest science museum in the Western Hemisphere.